The Fulton City School District just wrapped up the third quarter of the “It’s Cool 2B in School” attendance campaign. Granby Elementary School fifth grade student April Cardenas was recognized for her commitment to school and exemplary attendance rate and was the school’s “It’s Cool 2B in School” third quarter prize winner. 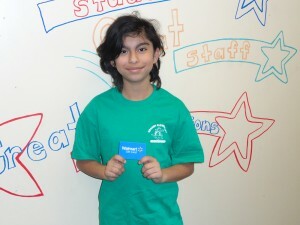 The honor earned April a Walmart gift card and some Granby Elementary School gear. The district recognizes that good attendance habits including arriving on time and ready to learn are critical to school success and also set the foundation for future success in college or a career. As part of the attendance campaign, Granby Elementary School students and their family members signed a pledge at the start of the school year to demonstrate their commitment to school. The names of all of the students that signed the pledge and then maintained an attendance rate of 90% or more during the quarter were entered to win a prize. Fifth grade student April Cardenas was the Granby Elementary School third quarter “It’s Cool 2B in School” role model student and prize winner. April was recognized at a recent school-wide assembly by Principal Heather Perry, who pointed out that April exceeded the minimum attendance rate of 90% with a 99% attendance rate.